We will help you achieve your goals, whether it is self defense, weight loss, confidence or to be a world champion. In the process, you will transform your life and become tougher, safer, fitter, and better. TOUGHER: Mentally and physically, it prepares you to overcome challenges in life and sport. SAFER: Widely considered the best self-defense system, it provides confidence in a world with the realities of bullies or attackers. FITTER: Building aerobic and anaero­bic conditioning and incinerating calo­ries, you will be exercising more often and with more intensity. Plus, it’s fun, dynamic, and even ad­dictive. BETTER: Its life lessons and character-building qualities not only you a better athlete, but also a better father, employee, wife, leader, and friend. We are located in the Galleria Village shopping center on the Southeast corner of Monroe Rd and Sardis Road North (behind McDonalds & Rite-Aid). Alliance is the most dominant competition team in the history of the sport. Alliance is the winner of 11 team World titles, including the last 9 consecutive, and is the only team in history to win all four major tournaments in a single year — and we did it 3 times. In 2011, 2013, and 2015 we won the World Championships, Pan Championships, European Championships, and Brazilian Nationals – the ‘Grand Slam’ of jiu jitsu. Lucas Lepri Brazilian Jiu Jitsu & Fitness represents Alliance exclusively in the Charlotte area and is also known as “Alliance Charlotte”. Those who train with us are also part of this global powerhouse team. 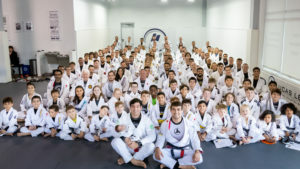 Alliance was founded in 1993 by Romero “Jacare” Cavalcanti (Alliance Atlanta) and his students Fabio “The General” Gurgel (Alliance Sao Paulo) and Alexandre “Gigi” Paiva (Alliance Rio).